I love creating with different items and mixing and matching materials – it makes for such a fun project! 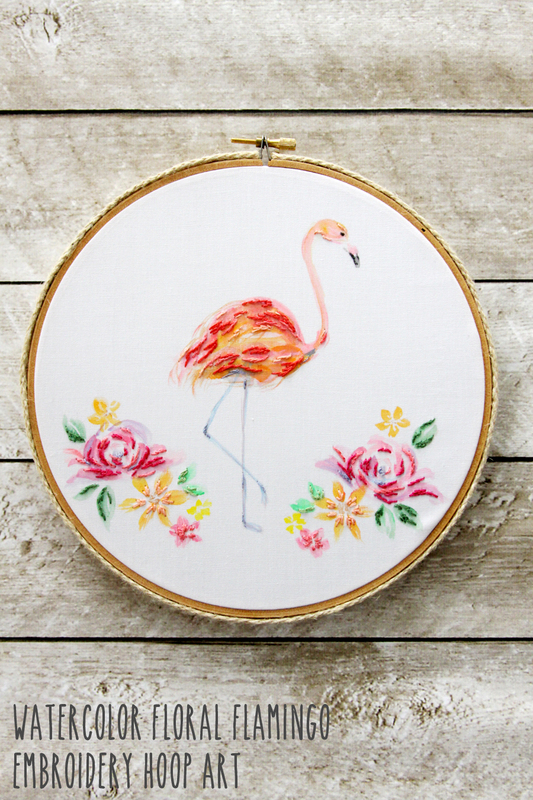 I had a blast with this Watercolor Floral Flamingo Embroidery Hoop Art – I combined watercolor with embroidery for a fun 3-d look. I’m definitely a beginner with watercolor so if I can do this, anyone can! 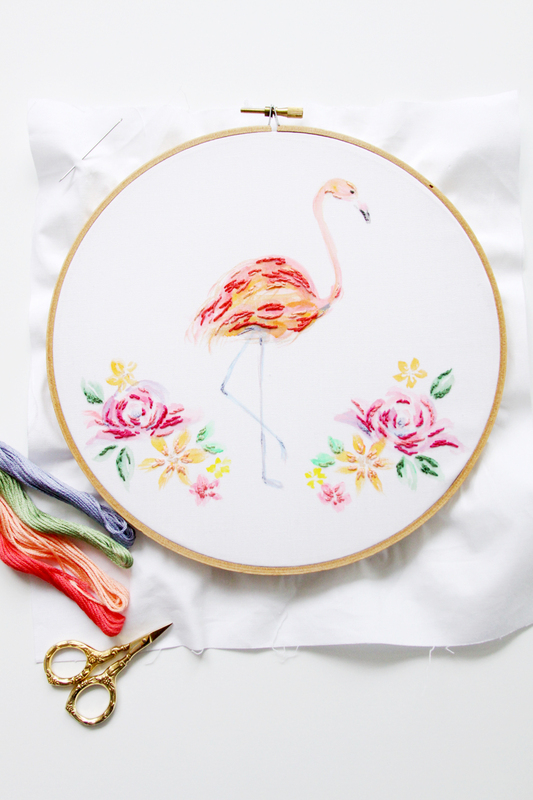 The embroidery really helps to cover up any little oopses and it adds such fun highlights. I painted this with the new Martha Stewart Watercolor Paint and brushes. It’s an awesome new gel based acrylic watercolor paint that is permanent so unlike traditional watercolors you can use it on all kinds of things – wood, paper, fabric, canvas and more! You can find these online and at Michael’s, they come in 40(!!) 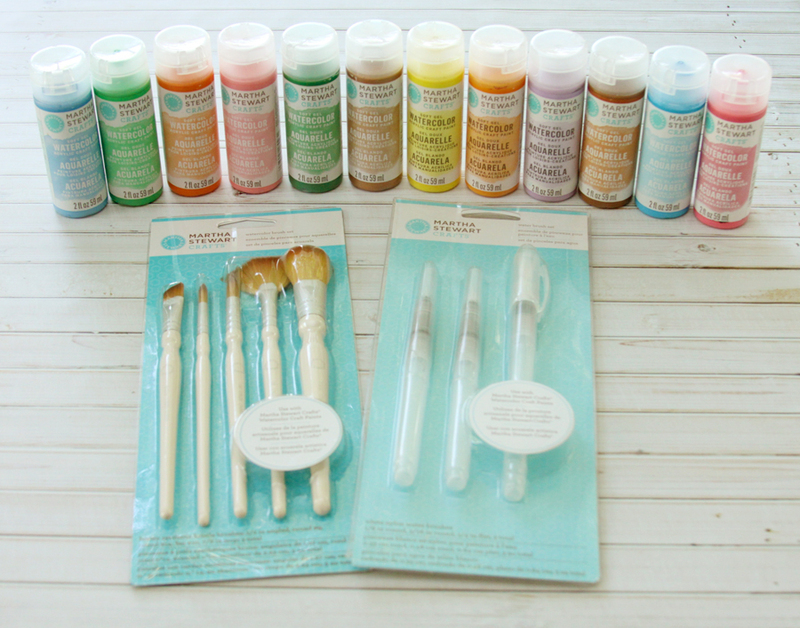 gorgeous colors and they have specifically designed watercolor brushes and new watercolor brush pens! Those are super cool – they have brush tips and you fill the base with water, then you can watercolor paint or do lettering on the go! They are so easy to use – so let’s get started on the tutorial! Begin by printing out your layout pattern. You can see I didn’t do this exactly, you want a more free form design to get that watercolor look but this will give you placement and size of flowers. 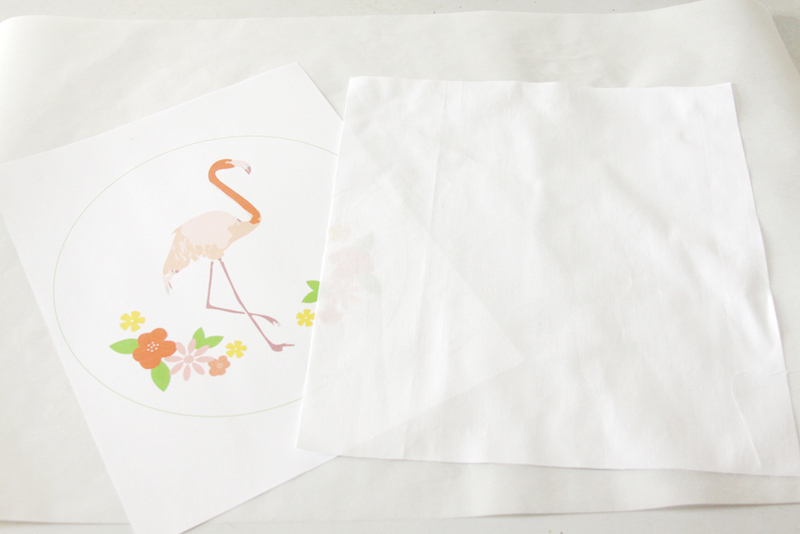 Place the pattern on the table, then cover the area with a sheet of parchment paper. This will protect your table. Place the fabric on top of that. 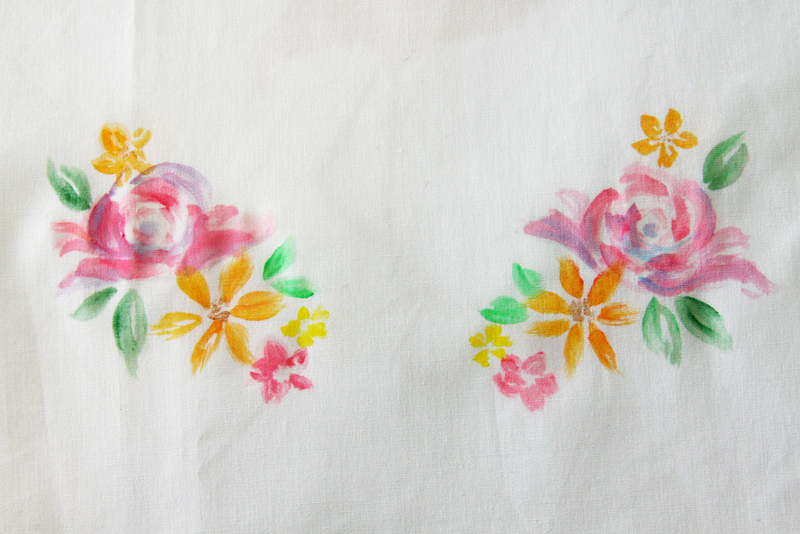 Begin on one side and paint in your flowers. You can use mine as a guideline or you can go wild and paint them however you’d like! You’ll want your brush to be a little wet but not dripping or the paint will spread and the color will bleed a little. If you’ve never done watercolor before, especially on fabric, it will help to practice a bit on some scrap fabric before diving in. 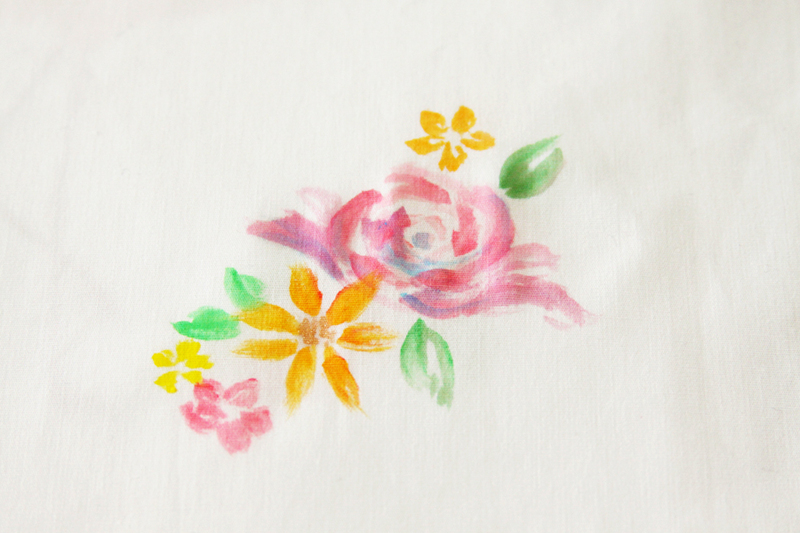 You could also use stencils for the flowers if you’re not comfortable freehanding this to start off – adhesive stencils work great with these watercolors so the paints don’t bleed under the stencils. Repeat for the flowers on the other side of the design. Try to keep them close to symmetrical in layout. They don’t have to be exactly the same, but you want the flowers about the same size and in the opposite locations. As your first colors dry, go in and add some highlights and color variations. It’s so fun to mix up different shades and colors! 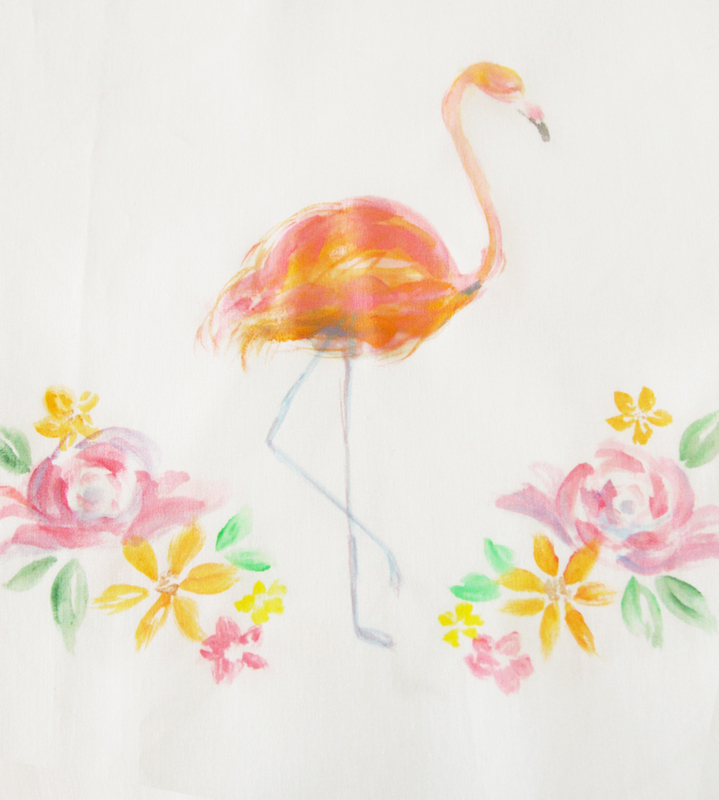 Paint in your flamingo, with several different shades in the body. 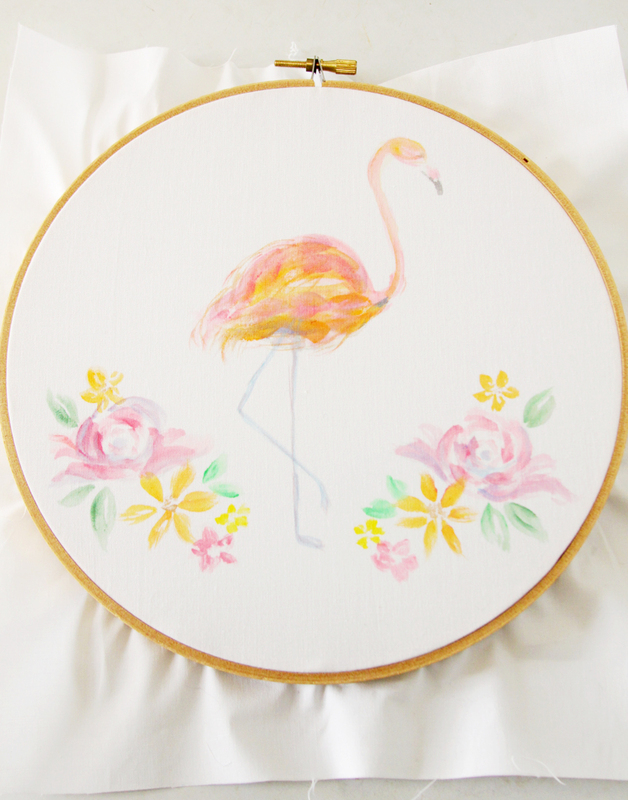 Once your fabric is dry, place the design in an 8″ embroidery hoop. 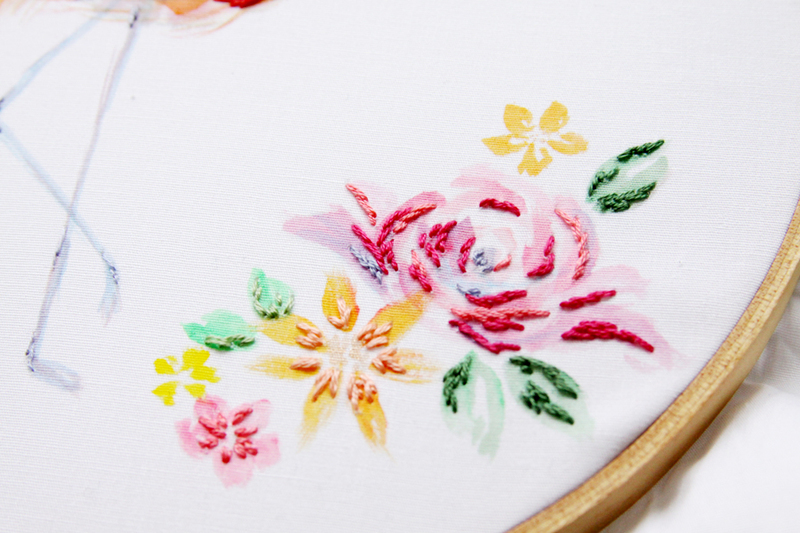 Using straight stitches, fill in some highlights with coordinating colors of embroidery floss. 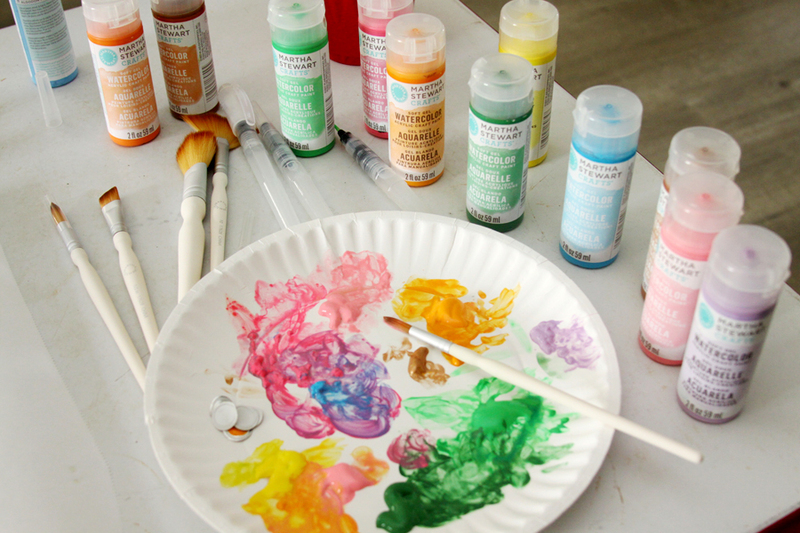 Use a mix of colors and shades, similar to what you did in the watercolor. Finish off the back of the hoop by trimming the fabric around the hoop to about 1/2″ and gluing it to the inside back of the hoop. 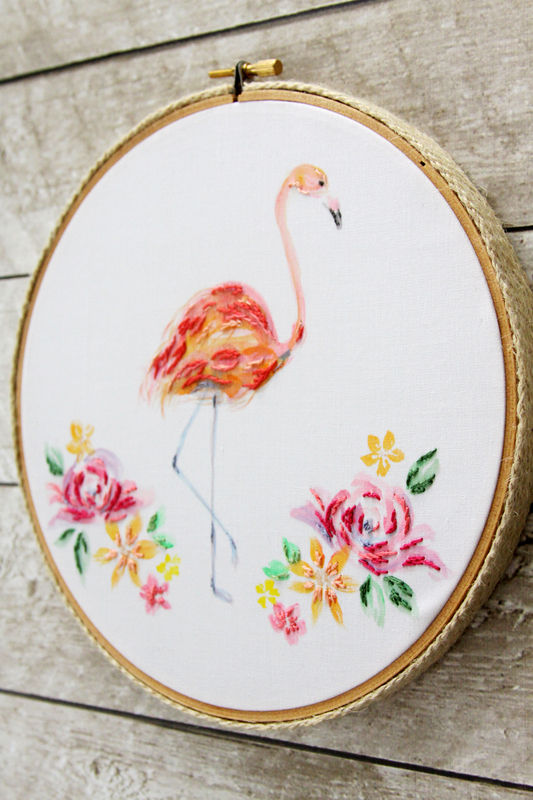 Add some trim to the hoop – I used this fun burlap bias tape. I think it looks so cute with the watercolor design! 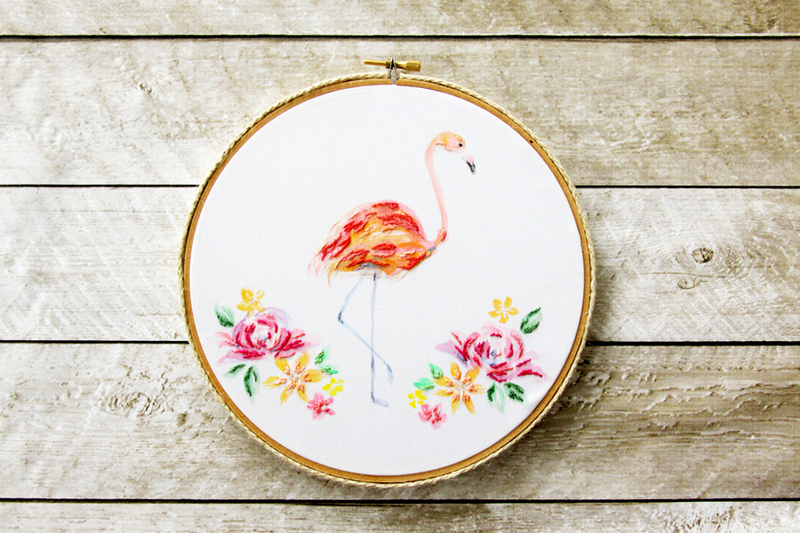 Now you can show off your cute new hoop! I think this would be so fun to do with all sorts of designs – a Monogram, a cute summer theme like a popsicle or even a holiday project. Have you done any watercolor before? It’s so relaxing and fun to work with! 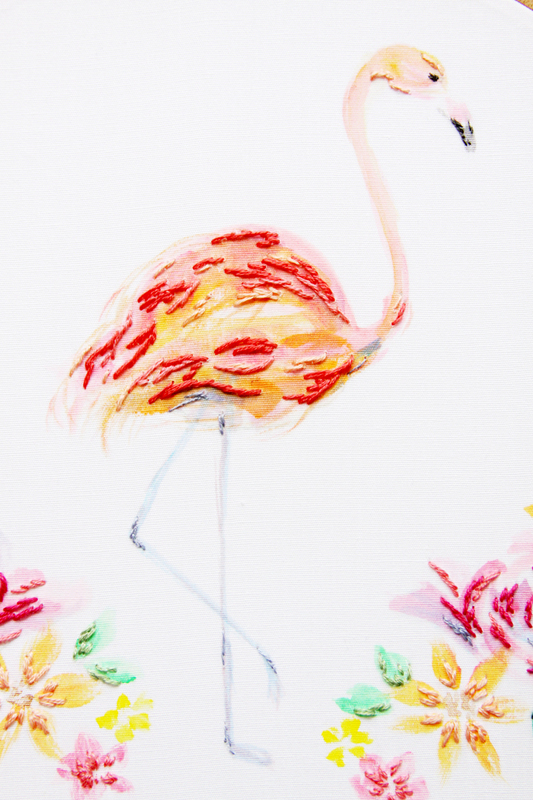 Make sure you check out all the info on the new Martha Stewart watercolors – you can find them exclusively at any Michaels store or at Michaels.com. While you’re there – check out Martha Stewart’s new Marbling Medium – it’s sooo easy to use and really fun! She also has a new Home Decor paint that has a really pretty eggshell finish. There are so many fun new products! I’d love to see any projects you make up with the watercolors! Neat. Did you free hand the flowers? It’s very pretty. This is beautiful Bev! Which is no surprise! 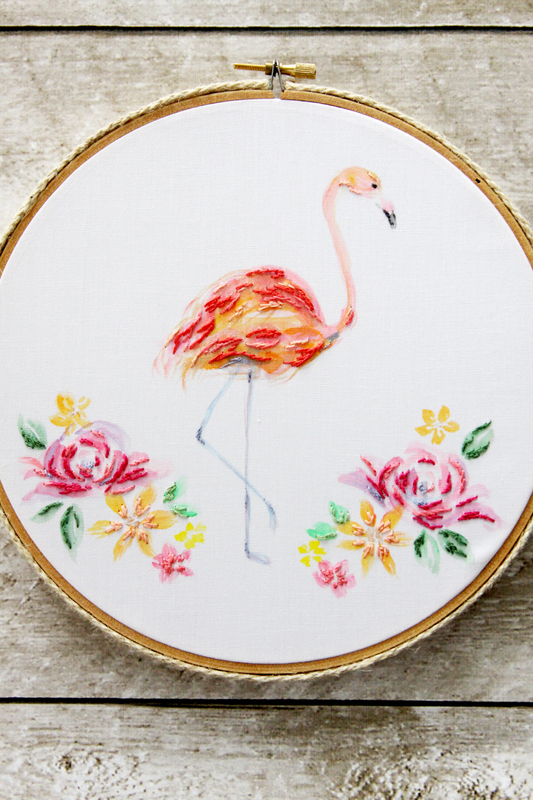 Loving the mix of watercolor and embroidery. Pinning! You definitely have an artist talent, your flamingo is perfect!! I love the colors, they blend so nicely!! Im glad you share your inspiration on #OHGWW thank you!! 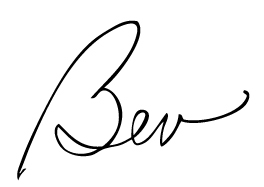 Bev you are so doggoned talented, it’s so inspiring to see what you do. Then adding the embroidery stitches sets off every detail to perfection. Just incredible. I feel so lucky to be a reader of your blog, have chance to learn from you. 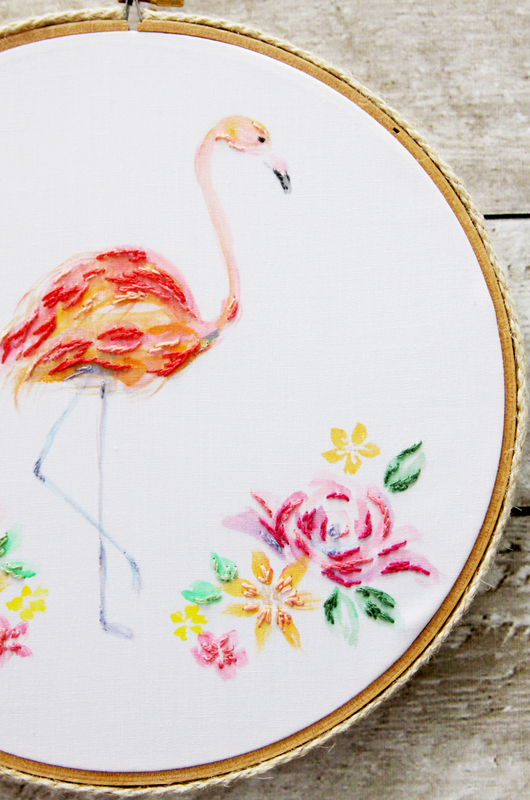 Isn’t it great how embroidery is becoming a sought after craft once again? 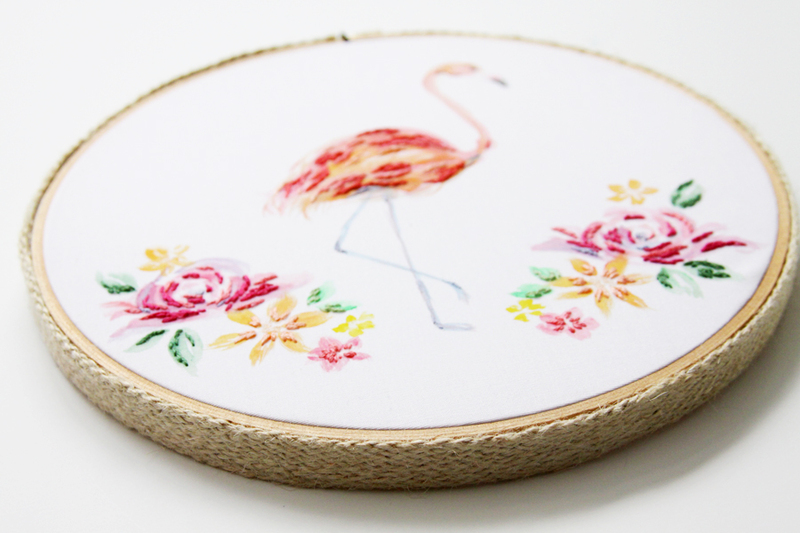 And you are sure helping embroidery to be important and doable, more interesting. 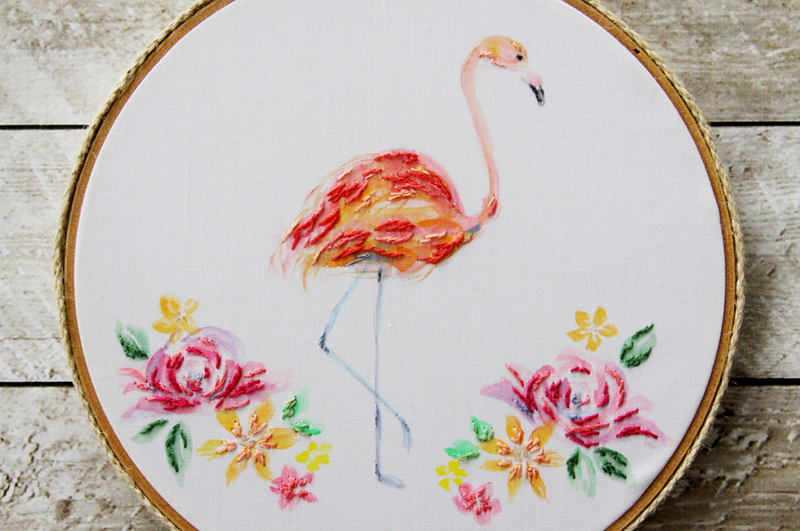 Wonder what this design would look like with some tiny beads on the flowers and parts of the flamingo on the stitches? You have got my imagination going full tilt now. Thanks for sharing tutorial with us. Beautiful. You always do the most detailed tutorials. Thank you for sharing at Snickerdoodle. 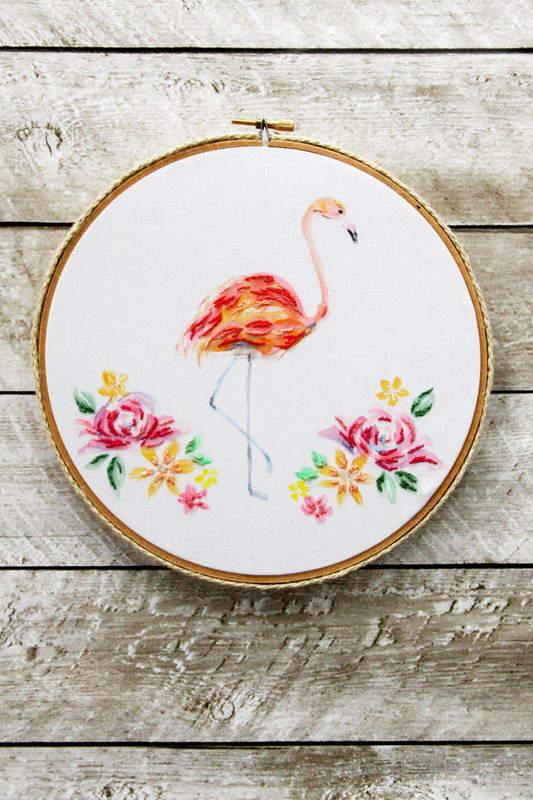 I am featuring your Watercolor Hoop Art at the party today. Love this! It’s so pretty and delicate looking. I love this project so much Bev! This is so pretty and I love the colors you chose for it. I have pinned it to try to recreate. I am glad you included a pattern for design! I love you mixed media craftiness soooo much. Thank you for sharing at TFT pinned and featured hugs! This is BEAUTIFUL!! And perfect for a friend. I’ll be making her one!